Rahmanan (RHMNN) - An Ancient South Arabian Moon God? Raḥmānān (RḤMNN) - An Ancient South Arabian Moon God? The fact is that even 'Allah's' most frequently used title, ar-Rahman (the Merciful) was known in South Arabia well before the advent of Islam, and signified a moon-god, whom Muhammed even occasionally confused with or used as a substitute for 'Allah'. The Koran mentions ar-Rahman occasionally, for example in sura 43:19, which most translators have renamed as God or Allah, since they, as Muhammed, found no difference between these two South Arabian moon-gods. According to the Koran, 'Allah' is one and no other god can be associated with him. This concept was most likely adopted from the South Arabian moon-god ar-Rahman (the Merciful), whose name was later adopted by Muslims as one of 'Allah's' titles. The missionaries group these and similar unsubstantiated claims under the heading of "The final and most frightening fact", asserting that "Muhammad's god is nothing more than a repackaged version of pagan deities"! Such words denote the essential elements of the missionary jargon whereby their statements are couched in a kind of doublespeak designed for internal consumption instead of tackling the issues at hand. The use of such language bears similarity with the early canting literature of seventeenth and eighteenth century England where lexicographers sought to explain those words, terms and phrases that had a special kind of meaning known to those folk mixing in certain circles. Finding its way into the anonymous B.E. 's Canting Crew published in 1698(? ), an idiom still in widespread use among English speakers centuries later seems comparable – "The pot calls the kettle black" which B. E. explains as meaning, "when one accuses another of what he is as deep in himself". It would be much too hasty to cast aside the unsubstantiated and unreferenced claims of the Christian missionaries based on an idiom several hundred years old. Consequently, it is incumbent upon one to apprise oneself of the scholarly literature regarding the origin of "the Rahman" or "the Merciful" in South Arabia. Was he a lunar deity? When did he first appear in the epigraphic South Arabian? Who worshipped him? The purpose of this article is to examine the claims of the Christian missionaries in the light of modern scholarship and provide a brief overview of the religion in South Arabia before the advent of Islam. The primary sources for understanding the religious history of ancient South Arabia are inscriptions which number into the thousands. Although some information can be obtained from eastern and western literary sources, inscriptions remain the way by which modern scholars approach the subject. One should remember however that the inscriptions only deal with a limited range of subjects – one cannot hope to reconstruct the entire lives of the South Arabian peoples based on inscriptions alone despite their large number. With this as our starting point, the religious history of South Arabia can be separated into two distinct time periods. Following Robin, the first period is that of polytheism which started c. 8th century BCE and lasted until c. 380 CE followed by the period of monotheism from c. 380 CE onward. It must be stated at the outset that the list of polytheistic divinities mentioned in the inscriptions do not constitute a south Arabian pantheon per se. An appraisal of the archaeological sites where divinities are praised or invoked leads one to the conclusion that the majority of divinities had a special relationship with a particular family, tribe or Kingdom. Robin terms these divinities as "institutional". Each Kingdom had an official pantheon consisting of a small number of divinities approximately numbering five. Let us now briefly focus on the organisational aspects of the most important divinities associated with the ancient south Arabian Kingdoms. The ancient South Arabian religion of each of the South Arabian kingdoms involved worship of a national god, who was the patron of the principal temple in the capital. In Sheba, it was Ilmaqah (also called Ilumquh or Ilmuqah or Almaqah or Almouqah), in the temple of the federation of the Sabaean tribes in Marib. The most solemn inscriptions always record the divinities of Sheba in the following order, ‘Athtar, Hawbas, Ilumquh, Dhāt-Himyam and Dhāt-Ba‘dānum. In Qataban, the national god was called ‘Amm ("paternal uncle"), who was the patron of the principal temple in the capital Timna‘. ‘Amm was seen as a protector of Qatabanite dynasty, and it was under his authority that the ruler carried out various projects of the state. The most solemn inscriptions always record the divinities of Qataban in the following order, ‘Athtar, ‘Amm, Anbī, Dhāt-Sanatum and Dhāt-Zahrān. In Hadramaut (or Hadhramaut), Syn (or Sayin) was the national god and his temple was located in the capital Shabwa. In Ma‘in, the national god was Wadd ("love") and it originated most probably from Northern Arabia. He was sometimes invoked as Wadd-Abb ("Wadd is father"). ‘Athtar was the only divinity common to the entire population of South Arabia, whereas other divinities were only worshipped in one kingdom only, or individualised with a specific title or qualifying name. The last three centuries of South Arabian history is called the "Late Sabaean Period" and is associated with the rise of monotheism. From the mid-4th century CE, the monotheistic religions such as Judaism and Christianity start to replace the traditional South Arabian religion. The first monotheistic inscriptions appear around the year 378 or 383 CE. The traditional South Arabian religion did not cease to exist overnight but it is astonishing that pagan deities are not mentioned after this date. Perhaps even before the rise of monotheism, the traditional South Arabian religions had already become weak and less attractive. Since the epigraphic material mostly stems from the upper class and does not reflect the situation of the lower class, this has led scholars to conclude that the rapid conversion to monotheism started with the upper classes such as the royal family and aristocracy, followed by the lower classes. The efforts of the Byzantine church to Christianize southern Arabia in 4th century CE appears to have been in vain. Only Najran became the well-known centre of Christianity in the Arabian Peninsula. The monotheistic period was mainly a period of Judaism. This is attested by Jewish words and phrases contained in Sabaean texts. In the Jewish Sabaean texts, "God" is called "Raḥmānān", , "the Merciful", the "Master of heaven and earth", "Lord of the Jews", etc. The best known event from the last period of South Arabian history is undoubtedly the persecution of Christians during the reign of the Jewish ruler Dhu Nuwas (c. 523 CE). Dhu Nuwas burned down Christian churches in Zafār and Hadramaut and then attacked Najran. The Christian population of Najran with their leader Harith were massacred. This led to a reaction from the Christian kingdom of Ethiopia, whose army led by Abraha, invaded southern Arabia, killed Dhu Nuwas and established Ethiopian rule over the south-western part of Yemen. It was only during the period of Ethiopian rule that Christianity played a dominant role in this region (c. 525 to 575 CE). There are a few Christian inscriptions of Abraha mentioning Raḥmānān. Now what do the Sabaean inscriptions from Jewish and Christian times say about Raḥmānān? Let us look at some of these inscriptions. Most of the inscriptions depicted below are part of the original ones. We are only showing the relevant material from the inscriptions that mention Raḥmānān. Interested readers may refer to the references cited for each of the inscriptions and their exact transcription for further details. 5. By the Merciful, Lord of the Jews. 11. ... and have mercy on all the world, O Merciful, you are Lord. 3. May rḥmnn [i.e., the Merciful] hearken unto his prayer. 12. any damager who may try to deface it. Recorded, written and supervised by Tamīm (or Tammām) of the family of ḤDYT. O Lord of the Jews! by the praiseworthy One. From the reading of the Jewish Sabaean inscriptions it is clear that Raḥmānān is called the "Lord of the Jews", "Master of Heaven" and the "Praiseworthy One". The people beseeched Raḥmānān to give them a life of justice, grant them children who will fight for Raḥmānān, asked for his mercy and to answer their prayers. Perhaps the two best known Christian Sabaean inscriptions are from the time of Abraha. The Christian inscriptions are different from their Jewish counterparts as there is no beseeching in them at all. The inscriptions begin by pointing out the "power" of Raḥmānān. An inscription relating to Abraha's campaign of Huluban discovered at Murayghan (or Mureighan), east of the upper Wadi Tathlith, records a defeat inflicted by Abraha on the North Arabian tribe Maadd in 662 of the Sabaean era. This inscription begins with the formula "By the power of the Merciful One and His Messiah". The titulature adopted by Abraha calls him the "King of Saba' and Raydan and Hadramaut and Yamanat and their Arabs in the plateau and lowland". 8-9 ... So Abraha returned from Haliban by the power of the Merciful One. The inscription adds an important phrase before rḥmnn, i.e., bkhyl, which the missionaries conveniently left out in order to label Beeston's translation as "dubious". Anyone familiar with epigraphic South Arabian would immediately recognize bkhyl as a phrase associated in situations where there is an invocation, i.e., b-khyl. So, what are b and khyl in epigraphic South Arabian? Let us check the lexicons of epigraphic South Arabian to answer this question. The convention for depicting consonant kh is ḫ in epigraphic south Arabian. Figure 1: Discussion on "b" in (a) Sabaic and (b) Qatabanian dictionaries. Figure 2: Discussion on "khyl" in (a) Sabaic and (b) Qatabanian dictionaries. The lexicons say that b is used as a preposition which can mean "in", "on", "with", "by means of", whereas khyl (written as ḫyl) means "resources", "means", "power", "might", etc. So the phrase b-khyl would mean "with the power of" or "by the power of" or "by the might of", etc. Likewise, the Sabaic lexicon inform us that Raḥmānān means "the Merciful One" [Figure 3]. A careful inspection of the translation provided by the Smithsonian Museum shows they translated Raḥmānān as "God", not an altogether surprising decision given that Raḥmānān is an epithet for God. Clearly, the missionary's equation of Raḥmānān (rḥmnn) with "power" has turned out to be false. Had the missionaries taken the opportunity to study the inscription properly, they would have realised they had not properly aligned the original text with the translation causing them to mistranslate Raḥmānān and label those previous scholars with incompetence. Abraha's long inscription on the Marib dam records the quelling of an insurrection supported by a son of the dethroned Esimiphaios in the year 657 of the Sabaean era; repairs effected to the dam later in the same year; the reception of embassies from Abyssinia, Byzantium, Persia, Hira and Harith bin Jabalat, the phylarch of Arabia; and the completion of repairs to the dam in the following year. The text of the inscription begins, "By the power and favour of the Merciful and His Messiah and the Holy Spirit". 8. and of 'their' Arabs on the plateau and in Tihamat. 16. ... in the name of the Merciful and, his son Christ, the victorious. Albert Jamme suggested that the Sabaean bronze horse inscription in the Dumbarton Oaks Collection mentions Raḥmānān and that this bronze statue comes from Christian times in Southern Arabia. This, however, was disputed by Ryckmans and Vandevivere. They asserted that there is no mention of Raḥmānān in the Sabaean bronze horse inscription and it was simply a misreading on Jamme's part. RAḤMĀNĀN: A SOUTH ARABIAN PAGAN GOD? During the second half of the 4th century the pagan formulas disappear from the texts (one single pagan text is later). Taking their place appear monotheistic formulas invoking the "Lord of the Heaven" (or ... "of Heaven and Earth"), and "the Merciful" (Raḥmānān). Christianity and Judaism, using the same terminology, had supplanted paganism. In the 4th-5th century A.D. the picture presented by the inscriptions change radically, in that all mention of the deities of the pagan pantheon virtually disappears, to be replaced by a monotheistic cult in which the unique God is called «the Merciful» (Raḥmān-ān), with the epithets «lord of heaven» or «lord of heaven and earth». This needs a slight qualification, for we do in fact have two inscriptions, one mentioning the traditional tribal deity Ta’lab and dated c. 397 A.D., the other mentioning ‘Athtar and dateable to about the middle of the 5th century. In the monotheistic period, then, is mainly a period of Judaism. This is testified by Jewish words and phrases in the Sabaean texts, even Jewish personal names, such as Yehuda, and the reference to the "tribe Israel". In the Sabaean texts "god" is called "Raḥmānān", the merciful, the "master of heaven and earth". The best known event in this period of South Arabian history is without doubt the persecution of the Christians during the reign of the Jewish King Dhu Nuwas, around AD 523.... This persecution of the Christians of Najran led to a reaction from the Christian kingdom of Ethiopia, whose army invaded southern Arabia, killed the Jewish king and established Ethiopian hegemony over at least the western part of Yemen. It was only during the following period of Ethiopian rule that Christianity played a dominant role in this region (from c. 525 to 575). The inscriptions of the Ethiopian viceroy and the later King of Saba', Abraha, commence with the Trinitarian formula "in the name of god (Raḥmānān!) and his Messiah and the Holy Spirit." The scholarly sources inform us that the appearance of the deity Raḥmānān in the epigraphic South Arabian is associated with the rise of monotheism, and in particular, with the rise of Judaism and then Christianity in ancient South Arabia. Hence it is clear that Raḥmānān was not a pagan deity and it was never worshipped as one by pagan South Arabians. The missionaries' "uncontested fact" that Raḥmānān was a deity also worshipped by pagans in South Arabia has now fallen flat on its face. Furthermore, this also refutes the claims of the missionaries that Raḥmānān of South Arabian pagans was not the same Raḥmānān worshipped by the Jews and Christians. The fictitious Raḥmānān of the South Arabian pagans claimed by the Christian missionaries did not even exist! How can one then "admit" to the "uncontested fact" that Raḥmānān was a deity worshipped by pagans in South Arabia? The Sabaic word Raḥmānān, translated as "the Merciful", can be written as rḥmn-n. The rḥmn is a noun marked with -n, a Sabaic definite article. This is nothing but al-Raḥmān in Arabic with al- as a definite article. Obviously, al-Raḥmān could not have been a pagan god worshipped in South Arabia. To confirm this let us now turn to the lexicographical issues surrounding this word. Once again, with recourse to an internet webpage, the missionaries inform the reader translating Arabic al-Raḥmān as "the merciful" is incorrect. According to them, “ ... this translation really doesn't make sense”, al-Raḥmān had an "earlier" meaning closer to "the Almighty" or the "all Powerful" and implies "power, not hope/benefit/grace or mercy". On the contrary, al-Raḥmān is derived from the tri-consonantal root rḥm. Of this root eleven forms occur 342 times in the Qur'an. Al-Raḥmān occurs fifty-seven times excluding the basmala where it occurs one hundred and thirteen times. Al-Raḥmān means Most Merciful, the Beneficent, the Lord of Mercy, and not "the Almighty" or the "all Powerful". To understand the word rḥmnn in the South Arabian context, let us look at the Sabaean lexicons. Figure 1 shows the entry "RḤM" in the Dictionary Of Old South Arabic: Sabaean Dialect. Figure 3: Raḥmānān in a Sabaic lexicon. RḤMNN is directly equivalent to al-Raḥmān, the name of God used in the Qur'ān some 170 times (including the basmala). Moreover, the Jews have a long history of using the name "ha-Raḥaman" in their liturgy. Again ha-Raḥaman is the Hebrew equivalent of Sabaic Raḥmānān. The word rachuwm, meaning "merciful", is also to be found in many instances in the Hebrew Bible and is only used as an attribute of God [Figure 4(a)]. It is derived from the root rchm, (identical to Arabic root: rḥm) which means "soft, compassion, mercy" [Figure 4(b)]. The following entries are from the Gesenius's Hebrew And Chaldee Lexicon To The Old Testament Scripture. Figure 4: The meaning of word (a) rachuwm and (b) its root racham in the Hebrew Bible. That al-Raḥmān should have been the name of a single God in central and southern Arabia is in no way incompatible with the fact that, when adopted by Islam, it assumes a grammatical form of a word derived from the root RḤM. One can see that there is no evidence that Sabaic Raḥmānān worshipped by the Jews and Christians, which is an equivalent of Arabic al-Raḥmān, was a Moon-god or a pagan god. It appears to be a massive Freudian slip on the part of the Christian missionaries to claim that their brethren in South Arabia before the advent of Islam were nothing but polytheists or pagans. In their fervour to hypothesise the lunar characteristics of Allah, the missionaries and apologists have engaged in self-imposed paganism – a worrying development. Apart from their telling ignorance about the ancient South Arabian religion, one can also notice that their old habits of claiming Allah being a Moon-god stick-in-the-mud. It was mentioned earlier that al-Raḥmān is an adjective from the trilateral root rḥm, the noun of which is raḥma. Raḥma has been used in the Qur'an for many different things (metaphorically, of course!). Hārūn b. Mūsā counted eleven: Islam, Paradise, rain, prophethood, blessing, the Qur'an, sustenance, victory, health, friendliness and faith. Suyūtī adds one more: protection. Undoubtedly, these are manifestations of God's mercy. There are two attributes of God related to raḥma: al-Raḥmān and al-Raḥīm. They occur in the Qur'an combined together in the basmala, Sūrah al-Fātiḥa and 2:163; 27:30; 59:22. Muslim scholars have observed the distinction between al-Raḥmān and al-Raḥīm in a number of ways. Most of the scholars consider al-Raḥmān as being more expressive of mercy, in the sense of it being extended to more than those which are the object of al-Raḥīm. According to al-Zamakhshari's commentary on Qur'an 1:1, al-Raḥmān covers the major and basic benefits while al-Raḥīm covers only smaller and subtler benefits. Muhammad ʿAbduh presented an interesting view. According to him, the word al-Raḥmān indicates the one who actively issues mercy, i.e., who extends benefits and favour, while the word al-Raḥīm indicates the source of this mercy within Him and shows that it is a permanent quality. In a sense neither of the two will do instead of the other. It is worthwhile adding (leaving aside basmala) that al-Raḥmān occurs only with al-Raḥīm in the Qur'an. By an obvious contrast, al-Raḥīm occurs many times with al-Ghafūr and al-ʿAzīz, and a few times with al-Tawwāb, al-Wadūd, al-Raʿuf and al-Barr. The use of al-Raḥmān in the Qur'an in certain contexts has confounded some western scholars. How can the Merciful be mentioned in contexts apparently associated with the opposite of mercy? In his A Concise Dictionary Of Koranic Arabic, the late Arne Ambros, Professor of Arabic and Islamics at the Institut für Orientalistik der Universität, Vienna, raised such a question listing six verses of the Qur'an without looking at their broader context. It will suffice to illuminate the first verse mentioned by him which is Qur'an 19:45. This verse was also used by the missionaries to show that "the word al-Rahman in this passage does not convey "benefit" or "grace", but conveys the threat of punishment". A closer look reveals something else. In Qur'an 19:45, Ibrahim invokes one of the most beautiful names of God, al-Raḥmān, to show that even though his father is involved in the gravest sin of idol-worshipping and associating partners with God, he is still sustained by Him by providing him food to eat, air to breathe, water to drink and granting him health to pursue his daily activities - thus showing the mercy of God over all His creation whether or not they believe in Him. When the pagans of Makkah were asked to bow before al-Raḥmān, they did not know who al-Raḥmān was. The Makkans were pagans and worshipped other gods beside Allah. So, it may as well be that they were ignorant of who al-Raḥmān was. Jomier suggests that the Makkans aversion to al-Raḥmān was because it was a deity that did not admit polytheistic worship unlike the people in their worship of Allah. This explanation was also given by al-Askar. Focussing on this suggestion, it, therefore, would not make sense to think of the Qur'anic al-Raḥmān as referring to pagan usage, since it is exactly this type of usage which the Qur'an condemns using the very name al-Raḥmān itself! Matching the ignorance of the pagans of Makkah, when the Christian missionaries mentioned the name al-Raḥmān, they did not know who he was and associated him with a "Moon god" or "pagan god" of South Arabia. To the missionaries, the ignorance of the Makkans allegedly supports their "contention that Rahman was a different god from the high god worshiped by the Meccans". In the same vein, it can be said of the Christian missionaries that their complete ignorance of al-Raḥmān, who they associate with a "Moon god" or "pagan god", clearly shows that they worship a different god than the god of their Christian brethren and the Jews in ancient South Arabia. Moreover, according to the missionaries "when the pagans of South Arabia spoke of Rahman they did not have either the Father of Jesus or the Trinity in view". Therefore, they ask "[h]ow, then, can anyone assert that the god of the South Arab pagans was actually the same God worshiped by Jews and Christians?" It did not occur to the missionaries that even the Jews of South Arabia did not have "Father of Jesus or the Trinity in view" when composing their texts in epigraphic South Arabian. The Jewish Sabaean texts are bereft of any mention of pagan deities of South Arabia as well as the mention of "Son", "Holy Spirit" or "Trinity" of Christianity. Thus, one may comfortably conclude that the god of the Jews is indeed different from the god of Christians. An ancient deity in southern Arabia known as al-Rahman became important to Muhammad. He used the name al-Rahman, which means "merciful," 169 times in the Quran to refer to the nature of Allah. With the exception of Allah, it appears more than any other descriptive term for Allah. As to what exactly is the import of this statement is unclear. "The Merciful" is an attribute of God which is used by the Jews, Christians and Muslims. This epithet was also used for the pagan deities in Syria and Palmyra. This is not surprising because, whether in the pagan or monotheistic milieu, a divinity must have as aspect of mercy. Without this aspect, a divinity can never be worshipped. Nöldeke considered that Allah's name al-Raḥmān was borrowed from the Jews. It is difficult to see why this must be the case when its use was wide-spread in the ancient Near East. Noting the impact of South Arabian culture in Makkah and Madinah was limited, Greenfield cautiously suggested the source of the title and epithet of Arabic al-Raḥmān might be found amongst Jews who had contacts with Arab monotheistic groups in the Arabian peninsula. Healey notes the Muslim usage of Arabic al-Raḥmān is often ascribed to South Arabian influence, but states that a North West Semitic antecedent cannot be ruled out. Something that should not be overlooked however is that epigraphic south arabian inscriptions mentioning Raḥmānān are to be found in the heart of Najd, Central Arabia. Traditionally the inscription of King Abu Karib As'ad has been interpreted as being of Jewish origin, and, although authored by a Jew, there is nothing in the immediate context to suggest the King himself was of the Jewish faith. Indeed, Rippin highlights the fact that there are some fourteen inscriptions mentioning Raḥmānān where there are no clear indications of Judaism or Christianity. Based solely on the historical circumstances Robin concluded there was a Jewish current to them. On the other hand, Arthur Jeffery acknowledges that al-Raḥmān originated from the common Semitic root RḤM and that it occurs in the pre-Islamic Sabaean inscriptions. This word is also found in the pre-Islamic poetry. As for the origin of al-Raḥmān in Arabic, Jeffery says that "the matter is uncertain". What is abundantly clear from the studies of Healey and Greenfield is that usage and context decide whether the epithet rḥmnn was to be considered in a polytheistic or monotheistic manner. Such was plainly explained by Rubin who states the epigraphical evidence regarding rḥmnn cannot be studied in isolation from the literary sources be they historical or hagiographical in nature. It was claimed by the Christian missionaries that al-Raḥmān, one of Allah's names, was known in South Arabia before the advent of Islam and that it was a Moon-god or a pagan god and that the latter was an "uncontested fact". A study of the South Arabian epigraphy antecedent to Islam shows that around the mid fourth century CE, self-described monotheistic religions such as Judaism and Christianity started to replace the traditional South Arabian religion. In the Jewish and Christian Sabaean texts, "God" is called "Raḥmānān" (rḥmnn), "the Merciful". In the Jewish context Raḥmānān was the "Master of heaven and earth" and the "Lord of the Jews". In the Christian context, the Sabaean inscriptions emphasize the "power" of Raḥmānān. Referring to the Sabaic dictionaries confirmed that the word rḥmnn is derived from rḥm, meaning mercy. There are no lunar connotations at all. The Sabaic dictionary also compares rḥmnn, i.e., Sabaic Raḥmānān, with Arabic al-Raḥmān and Rabbanic epithet Raḥmānā showing that they all mean the same thing, i.e., "the Merciful". Contrary to the claims of the missionaries, Raḥmānān was neither a Moon god nor a pagan deity; it was never worshipped as one by pagan South Arabians but it was the deity of the Jews and Christians. The missionaries colossal ignorance concerning the ancient South Arabian religion has been clearly evidenced by their own writings. No specialist of ancient South Arabian religion in the history of South Arabian studies has ever stated or even suggested Raḥmānān was a pagan moon-god. Rather this is a myth fantasised by the Christian missionaries specifically designed to advance their polemic. Regrettably, even something as straightforward as looking up a half-page encyclopaedia entry becomes so strenuous that the missionaries are incapable of accurately reporting the information they claimed to have read there. Instead they chose to deliberately misreport the information and in doing so fabricate evidence in order to suit their pre-conceived conclusions. This lens of distortion remains firmly in place for the remaining sections of their writings concluding with a recommendation commending the reader to the logic of Morey. The offer is returned declined. Its [Murayghan Inscription (Ry 506)] content completely destroys the reliability and historicity of the Muslim traditions – which claim that Muhammad was born in the same year when Abraha, along with his army and elephants, attempted to invade Mecca and destroy the Kaaba. This inscription says absolutely nothing about Mecca or the Kaaba. It also says nothing about elephants. As recently re-emphasised by Irfan Shahid, this inscription has nothing to do with Abraha's attempted assault on Makkah as described in the Qur'an and other Islamic sources. It is, therefore, not surprising then that we find no mention of the Kaʿaba, Makkah or elephants that the missionaries seem so eager in discovering. A far greater problem for the Islamic traditions is that the Sabean date on this inscription is 552 A.D. According to the most recent scholarship, Abraha died in 553 A.D. or shortly thereafter [Stuart Munro-Hay, "Abraha" in Siegbert von Uhlig, ed., Encyclopaedia Aethiopica: A-C (Wiesbaden: Harrassowitz Verlag, 2003).] - but, according to the Muslims, Muhammad was born in 570 A.D. So, if we want to believe the Muslim traditions concerning Abraha, we have to push Muhammad's birth back 15, 16 or even 18 years. This has enormous consequences for much of early Islamic history. If Muhammad was born 18 years earlier, when did Muhammad begin to receive revelations? When did the Hijrah occur? When did Muhammad die? When did various battles take place, and when did the first four Caliphs reign? This is potentially messing up everything that Muslims believe about their early history. Moreover, this may cast doubt on much of the Islamic Traditions. The accuracy of their so-called "Sahih" Hadiths cannot be trusted because the "chains of transmission" may now be broken - most events in the life of Muhammad has been pushed back 18 years and gaps are bound to open up somewhere in the chains between Muhammad and the time of Bukhari, Muslim, and the other collectors. He died at an unknown date after 553 A.D. These inscriptions do not independently "establish" anything. The Greeks and the Copts did not independently research, verify, and confirm the historicity and date of the hijra, they simply reckoned the date "according to the Arabs" (kata Arabas). These inscriptions do not verify the historicity of the hijra any more than my use of the abbreviation A.H.! If we assume that the "Year of the Elephant" was 570 A.D., then Muhammad could have been born anytime between 555 A.D. and 640 A.D. and could have died anytime between 615 A.D. and 700 A.D.! Aside from the fact that one would not expect to see an inscription on a tombstone that mentions Muhammad's death almost a decade before the missionaries think he could have died, this statement is devoid of any critical insight; similarly the death of ʿUmar, the second successor to Muhammad, is recorded in an inscription dated 24 AH. Are we to believe Muhammad died more than half a century after the second person to succeed him in the leadership of the Muslim community? The application of a modicum of critical faculty allows one to confidently discard the conclusions of the missionaries, who are obviously unable to distinguish those reports that are incoherent when placed into their geographical setting in late antiquity and synchronised with other important events in the near eastern timeline. From the use of dating systems in antiquity we now observe the authors next attempt at specialisation in the form of elephantology. The first thing the author informs us regarding elephants is that " ... the bottom of an elephant's foot is too soft to walk through the desert". This statement – appearing as it does, to be a statement of fact – is so utterly ludicrous that we almost broach the realm of outright quackery. From here the missionaries go on to describe the dietary requirements of modern day elephants finishing off with a few sentences discussing ‘sunburn’. Unfortunately, it did not occur to the missionaries that there may be different types of elephants than the results of their internet search would suggest. As it would seem reasonable to assume the elephants in Abraha's army would have been desert-adapted, let us consider a modern day population of desert-dwelling elephants (Loxodonta Africana) resident in north-western Namibia. We should first of all caution that the body of scientific literature in relation to this population of elephants is limited as they have not been well studied until recent times. Nevertheless, let us take the opportunity to briefly note some of the technical capabilities of these elephants in relation to the arid environment they occupy. Field results show they have developed specialised methods in dealing with harsh desert conditions including novel ways of thermo-regulatory behaviour in very high temperatures and knowledge of pre-existing water sources which can be a very large distance from their food sources. Their home ranges can reach amongst the highest levels observed of any African elephant with some members reaching approximately 12,000 km2 over a two year period. Needless to say they can “… walk through the desert”. It is the scenario of marching an army of elephants across the Arabian desert that is truly ludicrous! Due to the desert nature of the Arabian Peninsula, especially the Southern part, communication roads were limited to the area along the valleys, water streams and wells, because such areas were the only places where travellers and caravan men could rest and supply themselves with water.... In Yemen and other parts of Arabian Peninsula, we can trace some of the pre-Islamic roads, properly paved and constructed. Advanced machines and tools were used in cutting the rocks to construct passages in the mountains. Other roads in the valleys and plains were covered and paved with stones, as so appeared from remnants of these roads, which still exist in spite of all these long years of such negligence. Al-Nasser and Al-Ruwaite go on to list twenty-three important sites and landmarks on this route along with briefs descriptions. Today properly identifying this route is one of the major studies being undertaken by the Ministry of Antiquities and Museums in the Kingdom of Saudi Arabia. The Arabs did face war elephants in the Battle of al-Qadisiyyah when they fought the Sassanid-Persian army sometime around the year 636 A.D. The Persian war elephants completely terrified the Arab cavalry, and caused mass confusion and chaos among the Arab fighters for two entire days. On the third day of battle, the Muslim army changed its tactics and succeeded in frightening the Persian elephants. Why did they originally react as if they knew nothing of war elephants? From geographer we now turn to combat psychologist. The missionaries ponder why the Arabs were terrified of war elephants if they had already experienced them in battle? When America detonated a nuclear bomb on the residents of Nagasaki, one would not be inclined to doubt the historicity of the first nuclear bomb detonated on the residents of Hiroshima, based on the recorded reactions of those people at Nagasaki. A terrifying weapon of war is a terrifying weapon of war. From a specialist in ancient dating systems to elephantologist to geographer to combat psychologist, the Christian missionaries’ readiness to apply themselves to such a diverse number of academic disciplines claiming a working competence over them imbues the reader with an initial enthusiasm that is suddenly dampened as one examines their writings in more detail. When the famous English author Robert Greene was warning his playwriting friends of a new upstart actor he spoke of him disdainfully and labelled him a Johannes Factotum, in modern English a ‘John Do-everything’. The Oxford Companion To English Literature explains this term further and supplies the meaning “a Jack of all trades, a would-be universal genius.” The relevance of this figure of speech, however, fails at the first hurdle. The musings of the Christian missionaries can in no way be compared to elegant prose and poetry of William Shakespeare. M. Gotti, The Language Of Thieves And Vagabonds: 17th And 18th Century Canting Lexicography In England, 1999, Lexicographica Series Maior 94, Max Niemeyer Verlag GmbH, Tübingen (Germany), p. 16. This book forms a very readable introduction to the topic. "The Pot calls the Kettle Black" in B. E., Gent (anonymous), A New Dictionary Of The Terms Ancient And Modern Of The Canting Crew. In Its Several Tribes, Of Gypsies, Beggars, Thieves, Cheats: With An Addition Of Some Proverbs, Phrases, Figurative Speeches, 1698?, Printed for W. Hawes at the Rose in Ludgate-Street, P Gilbourne at the corner of Chancery-Lane in Fleet-Street, and W. Davis at the Black Bull in Cornhill: London, Section PO. There are no page numbers in this book. Section PO is located roughly three quarters in. C. J. Robin, "South Arabia, Religions In Pre-Islamic", in J. D. McAuliffe (Gen. Ed. ), Encyclopaedia Of The Qur'ān, 2006, Volume Five Si – Z, Koninklijke Brill NV: Leiden (The Netherlands), pp. 84-85. ibid., pp. 85-87; J. Ryckmans, "The Old South Arabian Religion", in W. Daum (Ed. ), Yemen: 3000 Years Of Art And Civilization In Arabia Felix, 1987?, Pinguin-Verlag (Innsbruck) and Umschau-Verlag (Frankfurt/Main), p. 107. J. Ryckmans, "South Arabia, Religion Of", in D. N. Freedman (Editor-in-Chief), The Anchor Bible Dictionary, 1992, Volume 6, Doubleday: New York, pp. 174-175; J. Ryckmans, "The Old South Arabian Religion", in W. Daum (Ed. 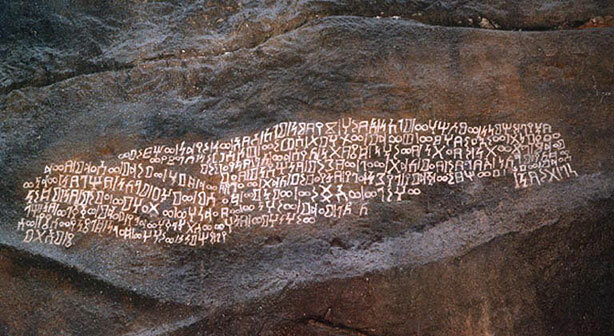 ), Yemen: 3000 Years Of Art And Civilization In Arabia Felix, 1987?, op. cit., p. 110; A. Sima, "Religion" in St. J. Simpson (Ed. ), Queen Of Sheba: Treasures From Ancient Yemen, 2002, The British Museum Press: London, p. 165; A. F. L. Beeston, "The Religions Of Pre-Islamic Yemen" in J. Chelhod (Ed. ), L'Arabie Du Sud Histoire Et Civilisation (Le Peuple Yemenite Et Ses Racines), 1984, Volume I, Islam D'Hier Et D'Aujourd'Hui: 21, Editions G. -P. Maisonneuve et Larose: Paris, pp. 267-268. With the exception of two inscriptions, one mentioning the traditional deity Ta’lab (c. 397 CE) and the other mentioning Athtar dated to mid-5th century. See A. F. L. Beeston, "The Religions Of Pre-Islamic Yemen" in J. Chelhod (Ed. ), L'Arabie Du Sud Histoire Et Civilisation (Le Peuple Yemenite Et Ses Racines), 1984, Volume I, op. cit., p. 267. A. Sima, "Religion" in St. J. Simpson (Ed. ), Queen Of Sheba: Treasures From Ancient Yemen, 2002, op. cit., p. 165. G. Ryckmans, "Inscriptions Sud-Arabes - Dixième Série", Le Muséon, 1953, Volume 66, pp. 314-315, picture of the inscription taken from p. 314. J. C. Greenfield, "From LH RḤMN To AL-RAḤMĀN: The Source Of A Divine Epithet" in B. H. Hary, J. L. Hayes & F. Astren (Eds. ), Judaism And Islam: Boundaries, Communication And Interaction - Essays In Honor Of William M. Brinner, 2000, Brill: Leiden, p. 387. Translation taken from here. G. Ryckmans, "Inscriptions Sud-Arabes - Onzième Série", Le Muséon, 1954, Volume 67, pp. 99-105, picture of the inscription taken from p. 100. J. C. Greenfield, "From LH RḤMN To AL-RAḤMĀN: The Source Of A Divine Epithet" in B. H. Hary, J. L. Hayes & F. Astren (Eds. ), Judaism And Islam: Boundaries, Communication And Interaction - Essays In Honor Of William M. Brinner, 2000, op. cit., p. 388. Translation taken from here. G. Ryckmans, "Inscriptions Sud-Arabes - Dixième Série", Le Muséon, 1953, op. cit., pp. 295-303, picture of the inscription taken from p. 297. W. L. Brown & A. F. L. Beeston, "Sculptures And Inscriptions From Shabwa", Journal Of The Royal Asiatic Society, 1954, pp. 60-62. G. Ryckmans, "Inscriptions Sud-Arabes - Dixième Série", Le Muséon, 1953, op. cit., pp. 275-284, picture of the inscription taken from p. 277. A. Jamme, Sabaean And Hasaean Inscriptions From Saudi Arabia, 1966, Studi Semitici - Volume 23, Istituto Di Studi Del Vicino Oriente: Roma, pp. 39-55. Transcription taken from p. 40. A. F. L. Beeston, "Two Bir Hima Inscriptions Re-Examined ", Bulletin Of The School Of Oriental And African Studies, 1985, Volume 48, pp. 45-46. For a detailed discussion of this term see M. J. Zwettler, "Ma‘add In Late-Ancient Arabian Epigraphy And Other Pre-Islamic Sources", Wiener Zeitschrift Für Die Kunde Des Morgenlandes, 2000, Band 90, pp. 223-309. A. F. L. Beeston, "Notes On The Mureighan Inscription", Bulletin Of The School Of Oriental And African Studies, 1954, Volume 16, pp. 391-392. Translation taken from here. G. Ryckmans, "Inscriptions Sud-Arabes - Dixième Série", Le Muséon, 1953, op. cit., p. 278. A. F. L. Beeston, M. A. Ghul, W. W. Müller & J. Ryckmans, Sabaic Dictionary (English-French-Arabic), 1982, Publication Of The University Of Sanaa (Yar), Editions Peeters: Louvain-la-Neuve and Librairie du Liban: Beirut, p. 24; S. D. Ricks, Lexicon Of Inscriptional Qatabanian, 1989, Studia Pohl No. 14, Editrice Pontificio Istituto Biblico: Roma, p. 19. A. F. L. Beeston, M. A. Ghul, W. W. Müller & J. Ryckmans, Sabaic Dictionary (English-French-Arabic), 1982, op. 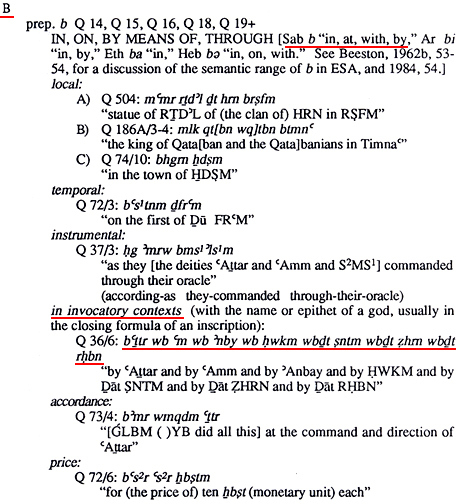 cit., p. 64; S. D. Ricks, Lexicon Of Inscriptional Qatabanian, 1989, op. cit., p. 72. Corpus Inscriptionum Semiticarum Ab Academia Inscriptionum Et Litterarum Humaniorum Conditum Atque Digestum, 1911, Pars Quarta (Inscriptiones Himyariticas Et Sabæas Continens), Tomus 2, E Reipublicae Typographeo: Parisiis, No. 541, pp. 278-296, picture of the inscription taken from p. 278. S. Smith, "Events In Arabia In The 6th Century A.D.", Bulletin Of The School Of Oriental And African Studies, 1954, Volume 16, p. 437. Translation taken from here. G. Ryckmans, "Une Inscription Chrétienne Sabéenne Aux Muées D'Antiquités D'Istanbul", Le Muséon, 1946, Volume 59, pp. 165-168. A. Jamme, "Inscriptions On The Sabaean Bronze Horse Of The Dumbarton Oaks Collection", Dumbarton Oaks Papers, 1954, Volume 8, pp. 317-330, For Raḥmānān see p. 318. J. Ryckmans & I. Vandevivere, "The Pre-Islamic South Arabian Bronze Horse In The Dumbarton Oaks Collection", Dumbarton Oaks Papers, 1975, Volume 29, p. 288 and pp. 301-302. A. F. L. Beeston, "The Religions Of Pre-Islamic Yemen" in J. Chelhod (Ed. ), L'Arabie Du Sud Histoire Et Civilisation (Le Peuple Yemenite Et Ses Racines), 1984, Volume I, op. cit., pp. 267-268. For a discussion on the definite article in epigraphic South Arabian, please see N. Nebes & P. Stein, "Ancient South Arabian" in R. D. Woodard, The Cambridge Encyclopedia Of The World's Ancient Languages, 2004, Cambridge University Press: Cambridge, p. 461. E. M. Badawi & M. Abdel Haleem, Arabic-English Dictionary Of Qur'anic Usage, 2008, Handbook Of Oriental Studies, Section One, The Near And Middle East – Volume 85, Koninklijke Brill NV: Leiden (The Netherlands), pp. 354-355. J. C. Biella, Dictionary Of Old South Arabic: Sabaean Dialect, 1982, Harvard Semitic Studies No. 25, Scholars Press: Chico (CA), p. 485; Also see A. F. L. Beeston, M. A. Ghul, W. W. Müller & J. Ryckmans, Sabaic Dictionary (English-French-Arabic), 1982, op. cit., pp. 116-117. A. Rippin, "Rḥmnn And The Ḥanīfs" in W. B. Hallaq & D. P. Little (Eds. ), Islamic Studies Presented to Charles J. Adams, 1991, E. J. Brill, Leiden, The Netherlands, p. 166. Are the non-Jewish, non-Christian, native Arabian Raḥmānists to be likened to the Hanifiyya, a group of pre-Islamic monotheists mentioned in the Qur'an? A reading of the historical circumstances within a "pre-figured system of co-ordinates" using a thoroughly Wansbroughnian framework, Rippin's article is a response to Beeston and Gibb's assertion that they are. Y. Moubarac, "Le Noms, Titres Et Attributs De Dieu Dans Le Coran Et Leurs Correspondants En Épigraphie Sud Sémitique", Le Muséon, 1955, Volume LXVIII, Number 1-2, pp. 122-123; idem., "Le Noms, Titres Et Attributs De Dieu Dans Le Coran Et Leurs Correspondants En Épigraphie Sud Sémitique", Le Muséon, 1955, Volume LXVIII, Number 3-4, p. 364. A. Fakhry, An Archaeological Journey To Yemen, 1952, Part I, Government Press: Cairo (Egypt), pp. 108-109 (Fakhry 74); G. Ryckmans, An Archaeological Journey To Yemen, 1952, Part II (Epigraphical Texts), Government Press: Cairo (Egypt), pp. 46-49 (Fakhry 74). C. J. Robin, "Yemen", in J. D. McAuliffe (Gen. Ed. ), Encyclopaedia Of The Qur'ān, 2006, Volume Five Si – Z, Koninklijke Brill NV: Leiden (The Netherlands), p. 566. "God, Names Of", Encyclopedia Judaica, 1971, Volume 7, Encyclopaedia Judaica Jerusalem, col. 684. A detailed study on the use of ha-Raḥaman in Jewish liturgy was done by J. C. Greenfield, "From LH RḤMN To AL-RAḤMĀN: The Source Of A Divine Epithet" in B. H. Hary, J. L. Hayes & F. Astren (Eds. ), Judaism And Islam: Boundaries, Communication And Interaction - Essays In Honor Of William M. Brinner, 2000, op. cit., pp. 381-393. S. P. Tregelles (Trans. ), Gesenius's Hebrew And Chaldee Lexicon To The Old Testament Scripture: Translated With Additions And Corrections From The Author's Thesaurus And Other Works, 1881, Samuel Bagster And Sons: London, for both rachuwm and racham see p. dcclxv; Also see F. Brown, S. Driver & C. Briggs, The Brown-Driver-Briggs Hebrew And English Lexicon Coded With Strong's Concordance Numbers, 2005 (9th Printing), Hendrickson Publishers: Peabody (MA), for rachuwm see p. 933, Strong's Concordance Number 7349 and for racham see p. 933, Strong's Concordance Number 7355. H. Hirschfeld, New Researches Into The Composition And Exegesis Of The Qoran, 1902, Asiatic Monographs - Volume III, Royal Asiatic Society: London, p. 68. The word Raḥmān-ān is especially significant because its northern equivalent, al-Rahmān, became later a prominent attribute of Allah and one of His names in the Koran and in Islamic theology. M. A. S. Abdel Haleem, "Context And Internal Relationships: Keys To Qur'anic Exegesis A Study Of Surat al-Raḥmān" in G. R. Hawtings & ‘Abdul Kader A. Shareef (Eds.) Approaches To The Qur'an, 1993, Routledge: London & New York, p. 95. ibid., p. 96. Also see Al-Ghazali [D. B. Burrell & N. Daher (Trans. )], The Ninety-Nine Beautiful Names Of God, 1995, Islamic Texts Society: Cambridge (UK), p. 54. M. A. S. Abdel Haleem, "Context And Internal Relationships: Keys To Qur'anic Exegesis A Study Of Surat al-Raḥmān" in G. R. Hawtings & ‘Abdul Kader A. Shareef (Eds.) Approaches To The Qur'an, 1993, op. cit., p. 96. A. A. Ambros (Collab. S. Procházka), A Concise Dictionary Of Koranic Arabic, 2004, Reichert Verlag Wiesbaden (Germany), p. 110 & p. 305. The other verses are 21:72, 36.23, 36:11, 50:33 and 67:20. A. Al-Askar, Al-Yamama In The Early Islamic Era, 2002, Ithaca Press in association with King Abdul Aziz Foundation For Research And Archives, p. 80. For the larger discussion see pp. 77-84. J. Jomier, O. P. (Trans. E. P. Arbez), The Bible And The Koran, 1964, Desclee Company: New York, p. 57. This is a modified English translation of Jomier's Bible et Coran published in 1959; also see idem., "Le Nom Divin «Al-Raḥmān» Dans Le Coran", in Mélanges Louis Massignon, 1957, Tome II, Institut Français De Damas: Damascus (Syria), pp. 361-381. B. M. Stortroen (Ed. G. J. Buitrago), Mecca And Muhammad: A Judaic Christian Documentation Of The Islamic Faith, 2000, Church Of Philadelphia Of The Majority Text (Magna), Inc.: Queen Creek (AZ), pp. 94-97. G. W. Braswell Jr., What You Need To Know About Islam & Muslims, 2000, Broadman & Holman Publishers: Nashville (TN), p. 20. J. F. Healey, "The Kind And Merciful God: On Some Semitic Divine Epithets" in M. Dietrich & I. Kottsieper, "Und Mose Schrieb Dieses Lied Auf" Studien Zum Alten Testament Und Zum Alten Orient: Festschrift Für Oswald Loretz Zur Vollendung Seines 70. Lebensjahres Mit Beiträgen Von Freunden, Schülern und Kollegen, 1998, Alter Orient und Altes Testament - Volume 250, Ugarit - Verlag: Munster, pp. 349-356; Also see D. S. Margoliouth, Mohammed And The Rise Of Islam, 1905, G. P. Putnam's Sons: London & New York, p. 143; For an up-to-date study of the use of RḤM in the Ugaritic context see G. Del Olmo Lete & J. Sanmartín (Trans. W. G. E. Watson), A Dictionary Of The Ugaritic Language In The Alphabetic Tradition, 2003, Part Two: [l - z], Handbook Of Oriental Studies, Section One, The Near And Middle East – Volume 67, Koninklijke Brill NV: Leiden (The Netherlands), p. 737. Also see C. H. Gordon, Ugaritic Textbook III: Cuneiform Selections - Paradigms - Glossary - Indices - Additions And Corrections - Bibliography, 1955, Analecta Orientalia - 35, Pontificium Institutum Biblicum: Roma, glossary 1755 and 1756 on p. 323 for rḥm. A brief and now slightly outdated study on the issue of rḥm in the Ancient Near East was done by Toufic Fahd. It is, nevertheless, quite useful. See T. Fahd, Le Panthéon De L'Arabie Centrale A La Veille De L'Hégire, 1968, Institut Français D'Archéologie De Beyrouth Bibliothèque Archéologique Et Historique - Volume 88, Librairie Orientaliste Paul Guethner: Paris, p. 141. Because Rahmān is a proper name not in Arabic but of Hebrew construction borrowed from the Jews, with whom Muhammad became more familiar during the latter part of his Meccan prophecy, and because the use of it caused some misgivings among his followers, so that it was advisable to supplement it with Arabic synonym of Rahim. J. C. Greenfield, "From LH RḤMN To AL-RAḤMĀN: The Source Of A Divine Epithet" in B. H. Hary, J. L. Hayes & F. Astren (Eds. ), Judaism And Islam: Boundaries, Communication And Interaction - Essays In Honor Of William M. Brinner, 2000, op. cit., pp. 389-390. J. F. Healey, "The Kind And Merciful God: On Some Semitic Divine Epithets" in M. Dietrich & I. Kottsieper, "Und Mose Schrieb Dieses Lied Auf" Studien Zum Alten Testament Und Zum Alten Orient: Festschrift Für Oswald Loretz Zur Vollendung Seines 70. Lebensjahres Mit Beiträgen Von Freunden, Schülern und Kollegen, 1998, op. cit., pp. 355-356. Covering much the same ground, Greenfield seems to have been unaware of Healey's study as it is not listed as part of his references, probably due to the short period of time between the publication of their respective articles. I. Al-Qattan & M. A. Ghul, "The Arabian Background Of Monotheism In Islam", in H. Köchler (Ed.) The Concept Of Monotheism In Islam And Christianity, 1982, Wilhelm Braumüller Ges.m.b.H., A-1090, Wien: Germany, p. 28. A. Rippin, "Rḥmnn And The Ḥanīfs" in W. B. Hallaq & D. P. Little (Eds. ), Islamic Studies Presented to Charles J. Adams, 1991, op. cit., pp. 164-165. Rippin notes there are seven explicitly Jewish Raḥmānān inscriptions and four explicitly Christian Raḥmānān inscriptions plus a number of lesser ones. A. Jeffery, The Foreign Vocabulary of the Qur'an, 1938, Gaekwad's Oriental Series No. LXXIX, Oriental Institute: Baroda, pp. 141-142. Z. Rubin, "Judaism And Raḥmanite Monotheism In The Ḥimyarite Kingdom In The Fifth Century", in T. Parfitt (Ed. ), Israel And Ishmael: Studies In Muslim–Jewish Relations, 2000, Curzon Press: Surrey, pp. 39-41. As early as 1889, Fritz Hommel drew attention to the mention of name Raḥmānān in South Arabian epigraphy saying that it "pointed to monotheism and perhaps to Judaism". See F. Hommel, "On The Historical Results Of Eduard Glaser's Explorations In South Arabia", Hebraica, 1889, Volume 6, No. 1, p. 51. I. Shahīd, "People Of The Elephant", in J. D. McAuliffe (Gen. Ed. ), Encyclopaedia Of The Qur'ān, 2004, Volume Four P – Sh, Koninklijke Brill NV: Leiden (The Netherlands), pp. 44-46. A. Sima, "Abraha" in S. Uhlig (Ed. ), Encyclopaedia Aethiopica, 2003, Volume 1 (A-C), Wiesbaden: Harrassowitz (Germany), pp. 42-43. Another recent encyclopaedia entry is, W. W. Müller, "(Abrehā, Abra(h)am)" in H. Cancik & H. Schneider (Eds. ), Der Neue Pauly: Enzyklopädie Der Antike, 1996, Verlag J. B. Metzler: Stuttgart (Germany), cols. 30-31. L. I. Conrad, "Abraha And Muḥammad: Some Observations Apropos Of Chronology And Literary Topoi In The Early Arabic Historical Tradition", Bulletin Of The School Of Oriental And African Studies, 1987, Volume 50, Number 2, pp. 225-240. As is made clear in the introductory paragraph, Conrad's article deals specifically with the chronological problems associated with the later stages of jahiliya, i.e., pre-hijra sira chronology. A. F. L. Beeston, "Problems Of Sabæan Chronology", Bulletin Of The School Of Oriental And African Studies, 1954, Volume 16, Number 1, pp. 37-56. With regard to Arabia in general for an excellent overview of the chronological issues one encounters see K. A. Kitchen, Documentation For Ancient Arabia, 1994, Part I - Chronological Framework & Historical Sources, The World Of Ancient Arabia Series, Liverpool University Press: Liverpool (UK). K. A. Worp, "Hegira Years In Greek, Greek-Coptic And Greek-Arabic Papyri", Ægyptus, 1985, Volume 65, pp. 107-115. S. Brock, "The Use Of Hijra Dating In Syriac Manuscripts: A Preliminary Investigation" in J. J. Van Ginkel, H. L. Murre-Van Den Berg, T. M. Van Lint (Eds. ), Redefining Christian Identity: Cultural Interaction In The Middle East Since The Rise Of Islam, 2005, Orientalia Lovaniensia Analecta - 134, Uitgeverij Peeters en Departement Oosterse Studies: Leuven (Belgium), pp. 275-290. The Christian calendar Anno Domini as it is known today has an interesting history. The credit for its invention is usually given to the Scythian monk Dionysius Exiguus who wrote mainly in the first half of the sixth century. The first major historical work to use this method of dating persistently is Bede's (d. 735 CE) Historia Ecclesiastica Gentis Anglorum. See P. H. Blair, The World Of Bede, 1990, Cambridge University Press, pp .268-270. Subsequently it took several hundred years before its use became spread throughout the Christian world in the Middle Ages. K. Leggett, "Effect Of Artificial Water Points On The Movement And Behaviour Of Desert-Dwelling Elephants Of North-Western Namibia", Pachyderm, 2006, Number 40, pp. 40-51; idem., "Home Range And Seasonal Movement Of Elephants In The Kunene Region, Northwestern Namibia", African Zoology, 2006, Volume 41, Number 1, pp. 17-36; idem., "Copropagy And Unusual Thermoregulatory Behaviour In Desert-Dwelling Elephants Of North-Western Namibia", Pachyderm, 2004, Number 36, pp. 113-115; idem., "Home Ranges And Seasonal Movements Of The Desert Dwelling Elephants Of Northwest Namibia", Unpublished Paper, 2005, pp. 1-7; idem., "Why GPS Collar Elephants? ", Unpublished Paper, 2005, pp. 1-5; idem., "Social Structure Of Desert-Dwelling Elephants", Unpublished Paper, 2006, pp. 1-8; K. Leggett, J. Fennessy & S. Schneider, "Seasonal Distributions And Social Dynamics Of Elephants In The Hoanib River Catchment, Northwestern Namibia", African Zoology, 2003, Volume 38, Number 2, pp. 305-316. A. Al-Nasser & A. H. Al-Ruwaite, "A Preliminary Study Of Darb Al-Feel “Road Of Elephants”", Atlal: Journal Of Saudi Arabian Archaeology, 1988, Volume 11, Part II, pp. 87-90. S. A. Al-Rashid, "The Development Of Archaeology In Saudi Arabia", Proceedings Of The Seminar For Arabian Studies, 2005, Volume 35, p. 208. R. Greene, Greenes, Groats-VVorth Of Wit, Bought With A Million Of Repentance. Describing The Follie Of Youth, The Falshood Of Make-Shifte Flatterers, The Miserie Of The Negligent, And Mischiefes Of Deceiuing Courtezans, 1592, Imprinted For William Wright: London, p. (facing page of) F2.